six × = six Required Please enter the correct value. With the markets pushing toward new highs nearly every week, investors wonder how long the bull will keep running. The answer is simple: The bull will run for as long as fresh cash keeps feeding it. And judging by the way the 2015 IPOs are shaping up, it's safe to say you should look for the bull to keep running through most of the year. Although it was a slow first quarter, we've already seen some notable 2015 IPOs – GoDaddy Inc. (NYSE: GDDY) raised $460 million and is valued at more than $4 billion. We also saw healthcare analytics company Inovalon Holdings Inc. (Nasdaq: INOV) raise $600 million on Feb. 12, selling 22.2 million shares at $27. And right now all eyes are on Etsy (Nasdaq: ETSY), the Brooklyn-based e-commerce website set to go public on April 16. With a price range of $14 to $16 per share, the company is expected to raise at least $250 million. 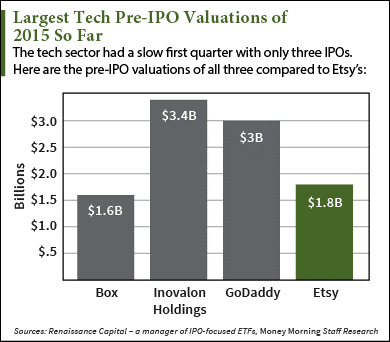 Following the IPO, Etsy will boast a valuation of $1.8 billion. And as exciting as those 2015 IPOs are, the best is yet to come. "In terms of how individual industries will fair in 2015, close to three quarters (73%) of those in the investment banking community are predicting an increase in offerings from the technology industry and better than two-thirds are forecasting an increase in IPOs in biotech (69%)." Merely equaling last year's performance would still make 2015 a benchmark season for tech IPOs. After all, 2014 saw more IPOs than any year since the height of the dot-com era in 2000. Leading the 2015 tech IPO pack is Uber Inc. The company has seen an annual growth rate of 145%. Since 2009, Uber has raised $2.8 billion in funding. It's currently valued at $40 billion.